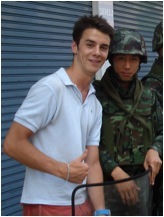 My name is Alex, I come from the South of France and I am currently in my first year of law at King’s College London. I have come across people suffering from Alzheimer several times through some family members but mainly in the hospitals of the Lourdes Pilgrimage in the French Pyrenees. On these occasions it stroke me that of all patients I had a chance to meet, those suffering from Alzheimer were almost always the most friendly, talkative and understanding. This contrasts sharply with the general stigma that, unfortunately, is often associated with the disease. We are too often guilty of distancing ourselves or drawing a distinction between us and those suffering from Alzheimer, badly degrading their dignity. -It is this general stigma and uneasiness that I think we can address by raising public awareness and demystifying the disease. -We hope to raise funds for the cause to donate to the various charities that are doing a fantastic job in supporting the families, both physically and financially, in the support of their loved one. We also hope to donate part of the contributions to research institutes in the hope of finding a cure to this terrible disease.